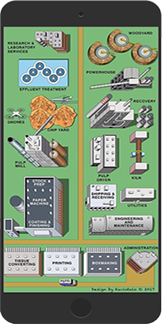 Paperitalo Publications surveys the worldwide pulp and paper industry on a different current topic on the 2nd Tuesday of each month. Summaries of those surveys are available here. Full survey results are available to subscribers to the Thompson Private Letter. For information on how to subscribe to the Thompson Private Letter (TPL), click on "More" below. November 2011: Quality and Product Differentiation (Survey 11-11) Full Results compare 2011 responses to 2010 responses (see below to purchase). October 2011: Quality and Product Differentiation (Survey 11-10) Full Results compare 2011 responses to 2010 responses (see below to purchase). September 2011: Effects of Subsidies (Survey 11-09) Full Results compare 2011 responses to 2010 responses (see below to purchase). August 2011: Environmental Impact Considerations (Survey 11-08) Full Results compare 2011 responses to 2010 responses (see below to purchase). July 2011: Contract Labor (Survey 11-07) Full Results compare 2011 responses to 2010 responses (see below to purchase). June 2011: Raw Materials (Survey 11-06) Full Results compare 2011 responses to 2010 responses (see below to purchase). May 2011: Expansion Plans (Survey 11-05) Full Results compare 2011 responses to 2010 responses (see below to purchase). April 2011: Foreign Competition (Survey 11-04) Full Results compare 2011 responses to 2010 responses (see below to purchase). March 2011: Foreign Competition (Survey 11-03) Full Results compare 2011 responses to 2010 responses (see below to purchase). Feb 2011: Staffing (Survey 11-02) Full Results compare 2011 responses to 2010 responses (see below to purchase). Jan 2011: Product Development & Design (Survey 11-01) Full Results compare 2011 responses to 2010 responses (see below to purchase). Dec 2010: Capital Plans 2011 (Survey No. 10-12) Full results compare 2010 responses to 2009 respsones (see below to purchase). Sep 2010: Effects of Subsidies (Survey No. 10-09) Full results compare 2010 responses to 2009 respsones (see below to purchase). Aug 2010: Environmental Impact 2010 (Survey No. 10-08) Full results compare 2010 responses to 2009 responses (see below to purchase). July 2010: Contract Labor 2010 (Survey No. 10-07) Full results compare 2010 responses to 2009 responses (see below to purchase). June 2010: Raw Materials 2010 (Survey No. 10-06) Full results compare 2010 responses to 2009 responses (see below to purchase). May 2010: Expansion Plans 2010 (Survey No. 10-05) Full results compare 2010 responses to 2009 responses (see below to purchase). 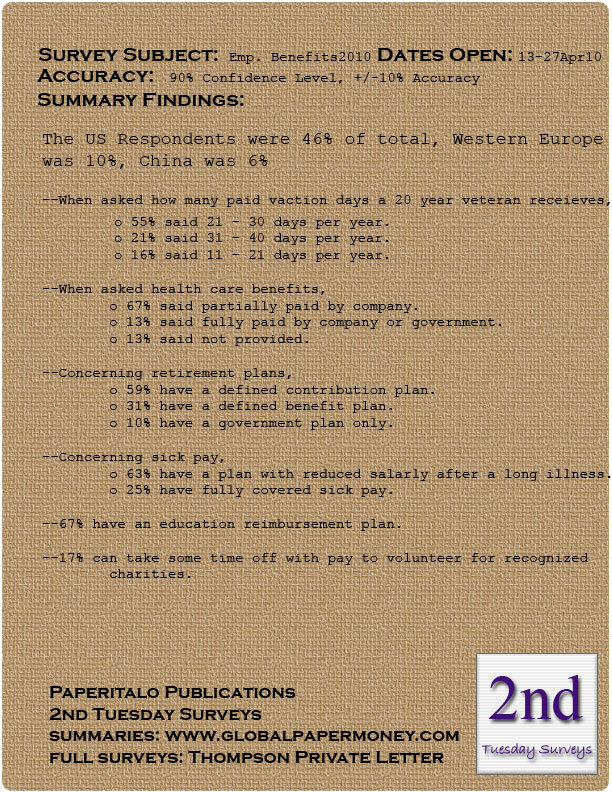 April 2010: Employee Benefits 2010 (Survey No. 10-04) Full results compare 2010 responses to 2009 responses (see below to purchase). 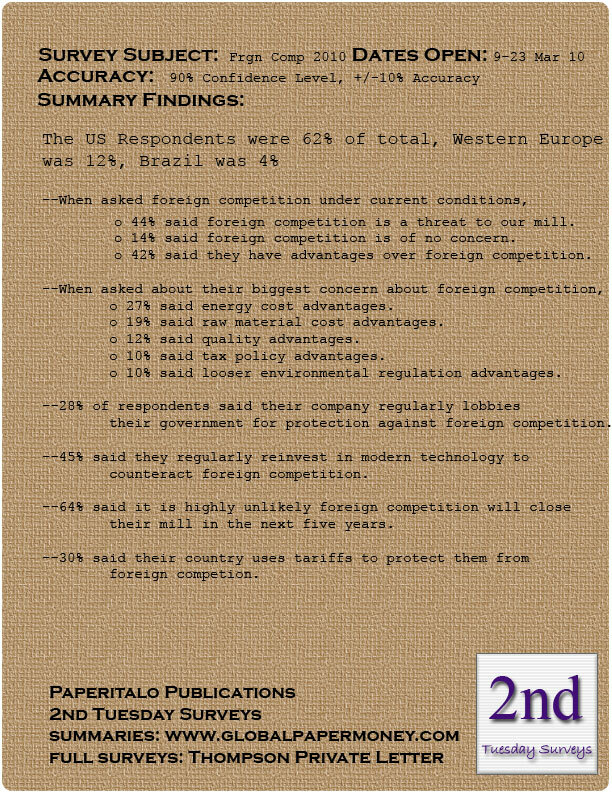 March 2010: Foreign Competition 2010 (Survey No. 10-03) Full results compare 2010 responses to 2009 responses (see below to purchase). February 2010: Staffing Plans for 2010 (Survey No. 10-02) Full results compare 2010 responses to 2009 responses (see below to purchase). 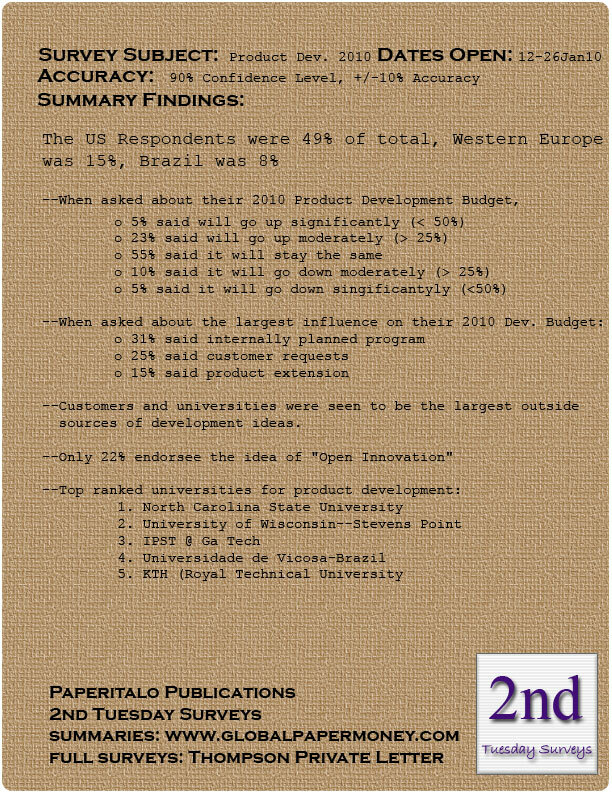 January 2010: Product Development Plans for 2010 (Survey No. 10-01) Full results compare 2010 responses to 2009 responses (see below to purchase). December 2009: Capital Plans for 2010 (Survey No. 09-12) Full results compare 2010 responses to 2009 responses (see below to purchase). If you want to participate as a respondent in Second Tuesday Surveys and are not receiving them now, just send an email to jthompson@taii.com with "Second Tuesday Survey" in the subject line. A drawing for four annual individual subscriptions to the Thompson Private Letter occurs upon the completion of each survey cycle. Individual Surveys are available in PDF ((C)Adobe) format. Purchase at the Paperitalo Store. 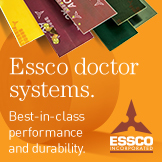 Individually purchased surveys are available on or after the same day they first appear in the Thompson Private Letter.